Originator of Shisakuya, “Sanken Industry” in Katsushika-ku of Tokyo has high-level lathe technique backed by experience and skill. We can process and mold both metals and resins. 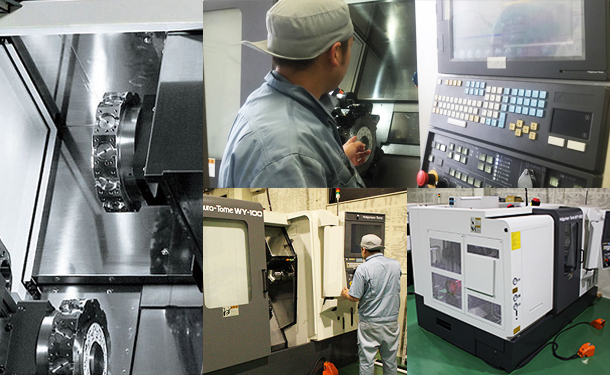 In addition, we can faithfully meet various needs of customers including prototypes of mechanical and exterior parts. Please feel free to make inquiry on our lathe technique. Our lathe technique handles metal, resin and any other materials. Our surface treatment includes heat treatment, alumite, plating, and coating. We can handle processing of products in small or large diameter, simple shaft processing by bench lathe, complex multi-face processing, products in other process, and any shapes. We have received orders from customers in a wide range of areas and have produced good results. Our machining technique and NC lathe technique assures wide variety of lathe technique beyond the boundary of product categories. We use technique of both machining and lathe. Some pencils have a special shape whose uneven curved surface gradually changes into a cylindrical shape. The characteristics are beauty of design prototypes and high precision of function prototypes. The cover is thin, and the axis is produced by quenching. High precision is the characteristics. The characteristics are high precision of resin cover and other many components with relatively high precision. The characteristic is that many products are a joint product of resin component and a shaft and are complex due to the fixation by pinning or press fitting. Another characteristic is that products often have a simple shaft on the contrary. The characteristics are mostly simple shapes and cost conscious approaches are taken. Consisted by large number of metal parts, variety of sizes and technical level. Mostly consited by metal and non-ferrous. Required ultra high prcisive technics and stabilized work. Producing various fields of prototypes. For details of Sanken Industry’s techniques, click the following pages.